On a moonless night in August, a man brings his new girlfriend to the remote family cabin where he has come for the fly fishing since he was a boy. Will she be the perfect catch -- or the one that got away? A bewitching story about how even our most intimate moments are shaped by the ghosts of the past, from the author of Jerusalem and Mojo. This is the second time Walking Shadow and director Amy Rummenie have gone to the Butterworth well. His first major success, Mojo, got the Walking Shadow treatment back in 2010. Mojo was a very different play - all male, steeped in violence. Part of my struggle with that play at the time was that the characters were all so completely clueless about their emotions that the opportunity for growth and change was slim. Here, in The River, you have characters so consumed by and in thrall to their emotions that they’re almost doomed from the start to being overwhelmed and swept away by them. 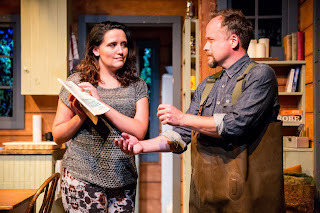 The man of The River is Andrew Erskine Wheeler, who played the pastor in the recent Walking Shadow production of The Christians (which blew me away in a way few other pieces of theater have done this year). Wheeler is equally good here in a very different role. He’s matched in intensity by the two main women of the play, portrayed by Emily Grodzik and Elizabeth Efteland. These three characters all want love so badly, it’s hard not to root for at least one of them to find it. Who that’s going to be shifts rather radically over the course of the play’s ninety minute run time. But the play often had me nervous for reasons I’m not entirely sure either the writer or the theater might want me to be. Blame it on popular culture if you like, but it’s hard not to worry when a man takes a woman to a remote cabin and always has a rather forbidding looking hunting knife on his person. Toss on top of that the fact that the man always seems haunted by another woman regardless of the one he’s with at any given moment. Then, just for perverse fun, the writer throws in a reference to Ted Hughes (not a spoiler, but see: Sylvia Plath). It’s a good reference, and a good poem (read in its entirety I might add). The play, and the characters, lean pretty hard on that poem, and even harder on another by William Butler Yeats but it’s a little difficult to understand why. The rest of the script, Butterworth’s own words, and the performances are so good, the poems hardly seem necessary. The River is one of the better plays about love I’ve seen in a while (I was about to say specifically heterosexual love, but with the focus they have, the translation here is pretty direct across the spectrum of sexuality). And not love as manifested in a relationship with a plot so much as just that big, unwieldy emotion of love itself - the need, the desire, the ache, the way one willingly deludes oneself into thinking you can ever fully escape your romantic past and not have it somehow taint your relationships in the present. This isn’t generic love. It’s quite specific, and those details matter. The surrender involved is both intoxicating and frightening. Can we avoid making the same mistakes over and over? Probably only if we’re willing to identify them and own them.